From Tuesday, December 11, 2018 8:00 AM at Wednesday, December 12, 2018 6:00 PM. experience and API-as-a-product have enabled companies like Stripe and Twilio to reach $9.2B and $5B in valuation. On the regulatory front, the EU Commission and many governments worldwide are forcing banks to open APIs and create innovative ecosystems, with, for instance, the Payment Service Directive 2 (PSD2). technologies like Docker, Kubernetes, GraphQL, Kafka, OpenId connect and API gateways enable the migration from legacy software to more agile systems, the deployment of software on any cloud in a safe and controlled environment. 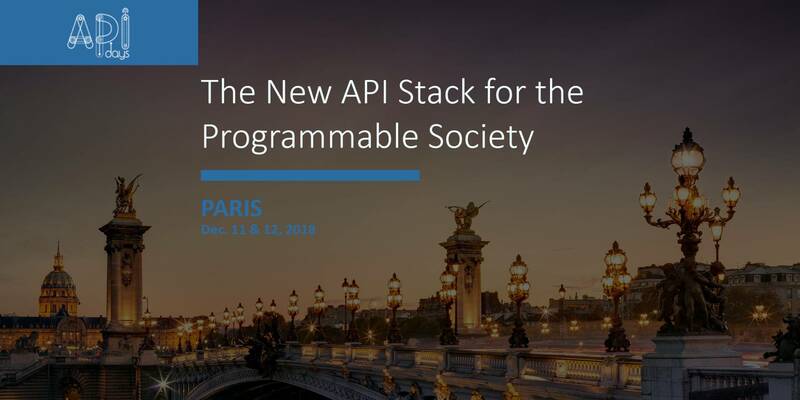 APIs are the digital contract of the 21st century, enabling us to enter into a programmable economy, a world where IT systems are able to discover themselves and integrate with each other without any human interaction. softwares to humans? With AI, how can we distinguish Chatbot APIs from humans online? How can we make the programmable world an inclusive space and educate everyone to the possibility of owning data and technology with Open data, Open APIs, OpenAI and Open source software? Connect with inspiring people and potential business partners, that you will meet at the event. Find the sessions, talks and workshops that are right for you.